According to The Hindu, Cochin Shipyard Limited (CSL) "has urged the Navy to place an order with it for a follow-on carrier of Vikrant-class." The CSL has reportedly committed to deliver the the follow-on Vikrant class carrier by 2022! The Navy, however, wants its next home built carrier to be much larger than INS Vikrant; it wants a 65,000 ton, possibly nuclear powered, super-carrier that can operate heavy aircraft, such as AEW&CS platforms for more effectively protecting the carrier battle from enemy fighters and cruise missiles. The Indian Navy (IN) currently operates two aircraft carriers - INS Virat and INS Vikramaditya. INS Virat's retirement in 2016 would reduce INs carrier strength to one. The Navy would then operate with a single carrier for at least the next 2 years, till INS Vikrant is commissioned in end 2018. From 2019 onwards, for the next 10-15 years till the super-carrier is delivered, IN will operate two aircraft carriers. Factoring in the requirements for maintenance and refits, assured availability would be limited to just one. The navy would need a third (reserve) aircraft carrier in order to operate two carrier battle groups, required to secure both the western and the eastern coasts. Reputed analysts like Ashley Tellis believe that India needs to monitor growing PLAN activity in the Indian ocean, which would be best done using a carrier battle group, not shore based aircraft. A CSL official told The Hindu, "A follow-on carrier would be advantageous for the Navy, as there would be no time lost on detailed design, development of specialist material, technology, honing of skills of the workforce and so on. Since the Navy desires to operate two carrier task forces at any given time, it would be a good option to exercise." There must be a good reason why the Navy has not shown interest in a follow-up Vikrant class carrier, and that reason could only be a tight budget! However, a solution to budgetary constraints may well lie in the inevitable project execution delays associated with new class ships in general and an ambitious super carrier in particular. The following are three good reasons why the Navy's coveted super carrier could take a long time to join the fleet. Clearly, a first of its class 65,000 tonnes nuclear powered, super carrier capable of launching heavy aircraft using EMALS would likely take 10-12 years to build. The Navy wants the new super carrier to be nuclear powered. That would require development of new nuclear reactors and propulsion system. Harbor and sea trials of such a nuclear powered carrier would take a long time. Longer perhaps than for INS Arihant, which was launched in 2009, and is still undergoing sea trials 6 years later. 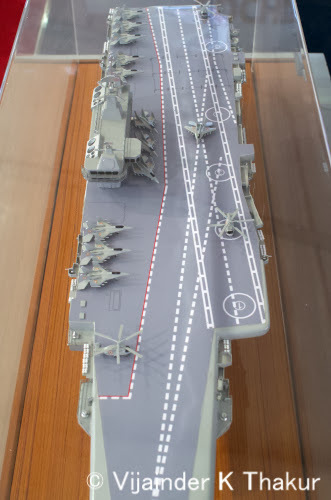 Air operations on the new carrier which will feature catapult assisted T/O will differ substantially from air operations on INS Vikramaditya and INS Vikrant which feature ski-jump short take-off. IN has no experience in designing a CATOBAR carrier. The last CATOBAR carrier that it operated, INS Vikrant, belonged to the Jurassic era of naval aviation. A new shore based training facility (SBTF) would be required. For those who still think my construction period estimate of 20 years is an exaggeration, here is the clincher - What if Saint Anthony returns as the RM!!! Haaaah! Make in India is fine, but how much sense does making a single ship of a class make? The IAF gets lambasted in the media for ordering just 40 Tejas LCAs, when it actually doesn't want any. Here we have the Navy ordering just one ship of a class that it designed for itself! And every one thinks the Navy is the smarter of the two services!